“This is the most people I have ever spoken in front of before”, announced Duncan Cohen, a Senior Training and Development Specialist at the U.S. Agency for International Development. It was only twenty-two days prior that Duncan was assisting in the Ebola crisis that is currently taking place in Liberia with the Office of Foreign Disaster Assistance. It is two minutes to seven on Monday December 8th in room 3101 in the Student Center at Marist College in Poughkeepsie, New York. Dressed in a navy blazer, white button down shirt, and light brown slacks, Cohen sips frequently from a paper cup filled with iced water as he waits for three Marist students to finish connecting his laptop to the projection screen. Cohen has been invited to speak at Marist by Dr. Claire Keith, the associate professor of French and coordinate of French and Global studies at Marist College. She has invited him to speak about his firsthand experience and the work he did in Liberian Ebola Treatment Centers. Cohen is the first guest of many to speak at Marist’s Global Studies Program, Center for Civic Engagement, First Year Seminar and UN Club new “From The Field” lecture series. Dr. Keith began the two-hour lecture with a dedication to Doctor Humarr Khan, a man, who was working with Doctors Without Borders in Ebola Treatment Wards and directly providing treatment to those who had the disease. Alongside a picture of Dr. Khan, was the quote, “If I refuse to treat them, who would treat me?” a response Dr. Khan gave to his sister when she asked him not to go and work in the Ebola Wards. Sadly, Khan ended up contracting the Ebola virus and died in July of this year in Sierra Leon. Duncan Cohen is originally from Washington, D.C. and got his first experience with world travel when his father got a job in Kenya when Cohen was a child. Cohen said his experience in Kenya planted a seed in him that “gave him the interest” to help people. 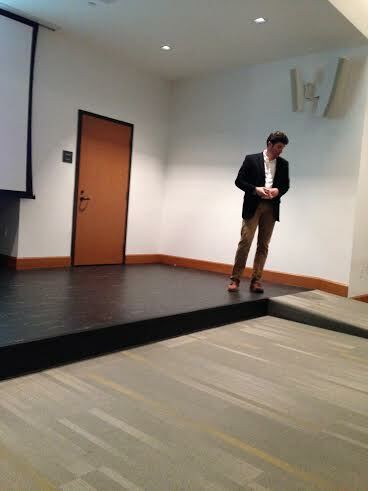 Duncan Cohen speaking at Marist College on December 8th. Photo courtesy of Christen Sblendorio. After earning his Bachelor of Arts Degree in Political Science and Spanish at the University of Illinois at Urbana-Champaign, Cohen continued on to graduate school at University of Maryland Baltimore County. He graduated with a Masters of Arts Degree in Intercultural Communication and Training and at age twenty-six found he was working at a job that “just wasn’t fulfilling enough.” It was in 2001 that he applied to the Peace Corps and one year after he submitted his application, he was offered an opportunity to go and volunteer in Guinea. After his three years in the Peace Corps, Cohen spent a brief amount of time working as Chemonics International as an Associate and at CHF International as a Program Officer. It was in 2006 when he began working with Doctors Without Borders as a Logistician. For three years he led logistical operations for Doctors Without Borders bases and rural health centers. During his three years with Doctors Without Borders he spent some time in the Democratic Republic of Congo where he expanded a program on immunization and oversaw construction projects on places such as health centers, hospitals, toilets, bridges, hangers, waste zones, and airstrips. Cohen currently works in Washington D.C. for USAID and with the Office of Foreign Disaster Assistance. He is an OFDA Senior Training and Development Specialist and has been with the OFDA training unit since 2012. During his time at OFDA, Cohen has supported multiple training programs. He has designed, developed, and revised instructor-led and on-line training sessions, courses, materials and presentations with subject matter areas including navigation, mapping and disaster assessment; security overseas; first aid and CPR; land mine awareness; and civilian/military collaboration. In September of this year, Cohen was sent to Liberia for two months to assist in the construction of various Ebola Treatment Centers. Liberia is one of the three countries that are suffering the most from the Ebola epidemic. The other two are Guinea and Sierra Leon. The fear the virus has instilled in people has resulted in a spike of deaths in preventable cases. Cohen explained that there has been an increase of women bleeding out after childbirth because they are afraid to go to their local health clinics in fear of contracting the Ebola virus.